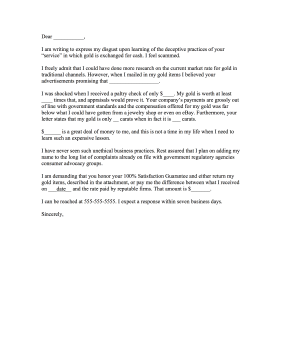 Fill in the blanks of this complaint letter to complain to an online cash-for-gold site. I am writing to express my disgust upon learning of the deceptive practices of your "service" in which gold is exchanged for cash. I feel scammed. I freely admit that I could have done more research on the current market rate for gold in traditional channels. However, when I mailed in my gold items I believed your advertisements promising that __________________. I was shocked when I received a paltry check of only $____. My gold is worth at least ____ times that, and appraisals would prove it. Your company's payments are grossly out of line with government standards and the compensation offered for my gold was far below what I could have gotten from a jewelry shop or even on eBay. Furthermore, your letter states that my gold is only __ carats when in fact it is ___ carats. $______ is a great deal of money to me, and this is not a time in my life when I need to learn such an expensive lesson. I have never seen such unethical business practices. Rest assured that I plan on adding my name to the long list of complaints already on file with government regulatory agencies consumer advocacy groups. I am demanding that you honor your 100% Satisfaction Guarantee and either return my gold items, described in the attachment, or pay me the difference between what I received on ___date__ and the rate paid by reputable firms. That amount is $_______. I can be reached at 555-555-5555. I expect a response within seven business days.